Thank You for today. Today is Cosmonautics Day! On April 12, 1961, the Soviet spacecraft Vostok-1 lifted off from the Baikonur Space Center. Pilot-Cosmonaut Yury Gagarin, the first man in space, flew aboard that spacecraft. Referring to all the inhabitants of the Earth to start on April 12, 1961 Yuri A. said:”…My whole life seems to me now a beautiful moment… It is hardly worth talking about those feelings that I experienced when I was offered to make this first-ever flight. Joy!” and … 5-4-3-2 Let’s Go! That flight took just an hour and 48 minutes. Having orbited the Earth, Vostok successfully landed in Saratov Region of Russia. Gagarin ejected himself from the aircraft at the altitude of several kilometers and descended near the place of Vostok’s landing by using the parachute. “Orbiting Earth in the spaceship, I saw how beautiful our planet is. People, let us preserve and increase this beauty, not destroy it!” Gagarin exclaimed. Said: Let’s go! Happily with hope. Happy Cosmonautics Day! Thank You for sharing this wonderful moment with me. 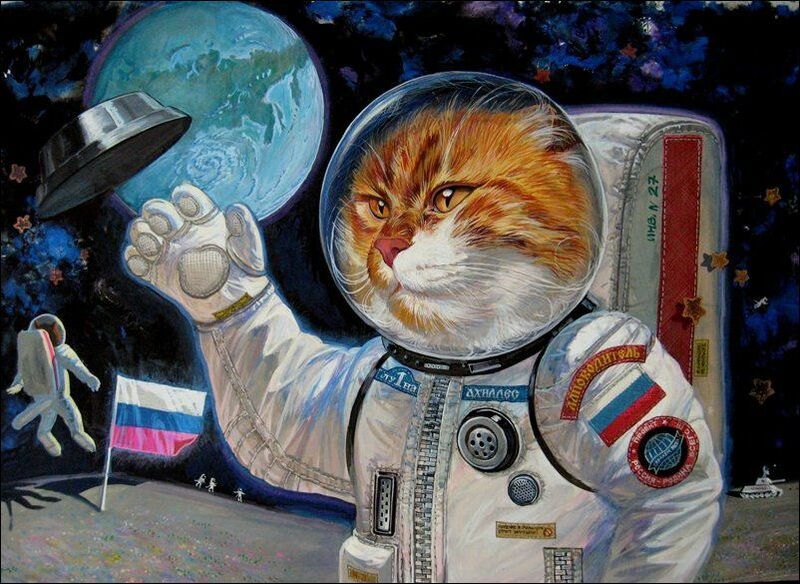 I ESPECIALLY LIKE THE CATS IN THE SPACE SUITS….AND THE HISTORY LESSON! Thank You, Jonathan, for your friendship and kind heart. I love the cat-monaut! 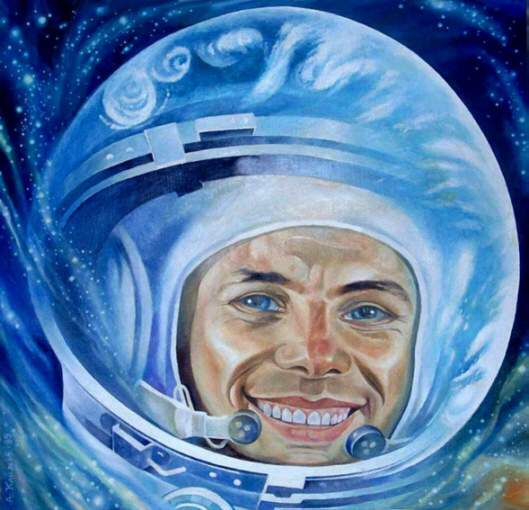 Did you paint Gagarin? Well done!! It is hard to remember all the details. I know I’m always rushing, from here to there, and everywhere! Have a great weekend! My kids are off from school tomorrow and the week after, so chaos is headed right for me! Have missed your posts. Where have I been?? Dear Claudia! Where have I been to miss your wonderful posts and your previous comment? So sorry. Oh, my Goddess, Claudia, please, keep my heart beating by your wise and necessary for me humour! Thank You! 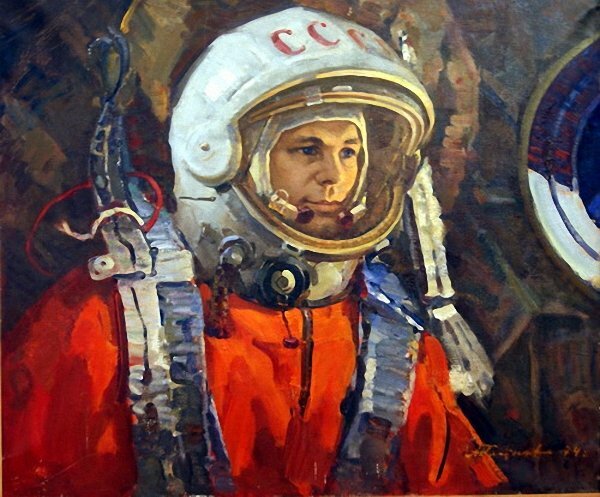 The History of space travel is so dominated by the American experience that people forget the bravery of Yuri. He took a real leap for mankind.